Sorry, i's just a sneaked iPhone photo! We spent the weekend in Las Vegas and didn’t go to the Strip. We didn’t gamble at all, even though there is a full casino at the South Point, where we were staying. It’s just way, way south of the Strip, probably five miles south of the airport. It was originaly the South Coast, a part of the Coast family of hotel/casinos, then bought and run separately. It’s pretty new, and well-cared-for. I was pleasantly surprised how consistently good the food was. Even the buffet, a Las Vegas hotel staple, was really pretty decent. We tried the Mexican-style restaurant, the Italian place, the 24-hour café, and a for-real Steak ‘n Shake inside the casino. All of the food was well-prepared, and most of the time the service was at least OK, and sometimes very good. The pool was nice and the area was really well-done, but the water was cold! I was surprised – yes, the air temp was from 90 to 95, but the water had be around 70 to maybe 75 degrees. We weren’t there to gamble or any of that. 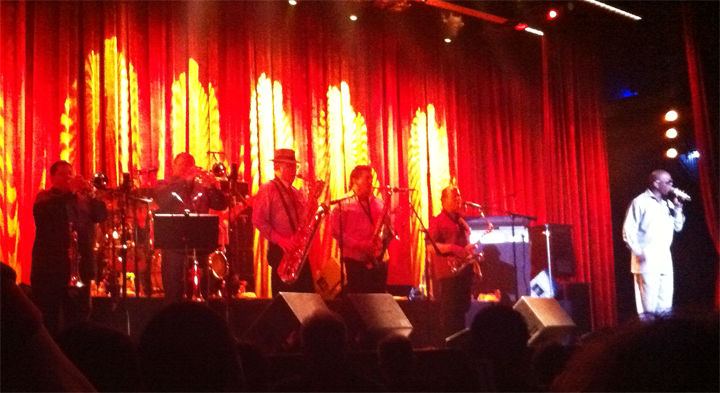 We were there to see Tower of Power, and we got tickets for all three nights. The concert venue was called a “showroom,” which meant it was multi-level seating with tables and booths around the outside. It looked like the tables are chairs could be removed so that the lower sections could be used as a dance floor. We’ve been in venues like that before, and while they were pretty intimate, the seating was somewhat uncomfortable. What amazed me was that this one was well designed for space – we never felt crammed together – and the sound system was truly excellent. I’ve complained about sound in some places we’ve heard Tower before, especially the House of Blues in Chicago. I don’t think HoB was really designed to project the subtleties of a band like Tower. The sound system there is designed to be felt, not heard, and it for certain does that! This one was loud – even a touch louder in the very back than it needed to be – but it was clear as any I have every heard. I’ve never heard the individual horns as clearly as I did there. I also never heard the background vocals as well. That was the real treat, to hear the vocals. While these guys aren’t noted for being big vocalists, they do a nice job singing backup harmony. Emilio Castillo, who is the co-leader of the group for 44 years now, tends to sing the high lead backgrounds in a head voice. I can tell you that this weekend Mimi was in good voice and we were able to hear him, and the rest of the band, especially on things like the end of “You’re Still A Young Man. The first night we sat over on stage right on the second level, about two-thirds of the way back. The second night, we were in the back, in a booth, next to the sound and light boards. The third night we were stage right again, about halfway back. We’ve been seeing Tower for almost twenty years, all over the country. It’s been our one vice. We’ve seen them at Illinois State University in Bloomington-Normal, at the old Grant Park in Chicago, at the Venue at the Horseshoe Casino in Indiana, at Ravinia outdoors (in Highland Park), at an outdoor venue in San Diego, in an auditorium at Michigan State University, at two locations in Fort Wayne, Indiana (indoors and outdoors), on New Year’s Even at Universal Studios Citywalk in Orlando, at the Zoo in Portland, Oregon, and at three different venues now in Las Vegas. And of course, House of Blues in Chicago. I have to say this was, by far, the best sound for the band I’ve ever heard, in what has to be at least twenty separate shows. This is a problem. If they come back here again, we’re going to have to come back! This gets a little expensive. The rooms were affordable this time because my wife made the reservations early enough and the economy has made hotel rooms in Las Vegas more inexpensive. By now, the place was full with several conventions and such and getting a room in the last couple of weeks would have been impossible. I sure hope Southwest drops their rates soon! And Tower? To me they sound as good as they ever have. I thought the band from about six or seven years ago, with Mike Bogart on lead trumpet and Jeff Tamelier on guitar, was the best band personnel mix they ever had. The new trumpet player, Sal Cracchiolo, and the guitarist, Jerry Cortez, are not only very competent in playing their parts but both are truly excellent soloists. Sal is much more of a jazz soloist than any lead trumpet they’ve had in years, maybe since Mic Gillette, and with Adolfo Acosta as the second trumpet, who has great solo chops and solid high range as well, the top end of the horns is in fine shape. Tommy Politzer just gets better and better as the solo tenor player, with a strong and agile altissimo register, and Roger Smith has been given more solo space as time goes on, especially on Hammond B3. The “Old Guard” – the founders who are still there – David Garibaldi, drums; Francis “Rocco” Prestia, bass; and co-leaders Stephen “Doc” Kupka, bari sax; and Emilio Castillo, tenor sax; are just as solid as ever and seem still to be having a great time after 44 years. The face of the band for the last ten years or so, the lead vocalist, Larry Braggs, has matured into an incredible showman as well as a gifted and inspiring singer. His singing just gets better all the time, and he’s getting more chances to show what he can do, like on tunes like the band’s cover of “Me and Mrs. Jones” from the “Great American Soulbook” album. The longer Larry’s been with the band the more the band has molded a bit to him and he to the band. Larry’s been with the band longer than any other lead singer now, and he was a great find. He’s able to sing practically everything from their 40-year repertoire, and do so convincingly. For these shows they pulled out an oldie, “Below Us, All The City Lights,” from the “Back to Oakland” album from 1974. The chord progression and melody sounds a lot like the tunes Doc Kupka wrote for his “Doc Goes Hollywood” record for his own Strokeland label. It works, but it’s got to be tough to sing, hearing where the melody goes next. Larry handled it beautifully each night. Okay, so what didn’t you like? Not much, and I suspect you can tell that. They never start at 7:30 on the dot, and a usual show for them is about an hour and twenty minutes, plus one encore (Saturday and Sunday they played two). This time apparently they were supposed to be out at 9:00 – there was another show in the venue at 10:00. Mimi said something about being overtime and still planning to play two encores on Saturday. The big issue is that Tower is a stand up and clap and dance kind of group. You don’t sit down when they play. But in a room like this you have to, because the sight lines make it impossible for the people below you to see unless they are also standing. The tiers and right angles make that worse than some other venues. The tables tend to pack people in close, too, which also makes it hard to move without sticking an elbow in somebody’s eye. Also, some of the front seats are reserved for high rollers as comps – so you get some folks down front who have no idea what the hell they got themselves into. Sometimes they make a hasty exit about ten minutes into the show. Nature of the casino beast, I guess. I really enjoy the places like Humphrey’s in San Diego that has a big enough pit area in front for the die-hard fans to come up and hand and carry on and everybody else can sit back and see. It’s an outdoor place, and the sound is just OK, but when I’m right underneath Doc’s bari I really don’t care! All together, a great time, and a location I would highly recommend. I’m afraid it will be very hard to resist the temptation to go back if they play there again next year!